Additional staffing for the Whittier Fire is on hand as forest service officials say sundowner winds are expected in the area overnight. While little fire activity is anticipated, fire officials say winds could kick up embers and they want to be ready just in case. The fire, which broke out the afternoon of July 8 on the south side of Highway 154, has burned 18,430 acres and remains 87 percent contained. Full containment is expected by Aug. 30. Los Padres National Forest Service Spokesman Andrew Madsen says the last few miles of containment line is on the southern edge of the fire in a very rocky area. Madsen says they plan to continue water drops in that area to tame the fire and let it smolder out on its own. Firefighters will monitor the fire and make sure it does not escape past what Madsen called the "target area." There are currently 125 forest service personnel and two helicopters still assigned to the fire. The cost to fight the fire is now at $38.4 million, according to Madsen, who says the majority of the money was spent early on. Firefighters are currently working to protect about $150 million in "local private values," including property, agriculture, ranching and more northwest of Goleta, Madsen said, adding that firefighters "should be in good shape if we get through this night." 87 percent contained on Monday. Black line represents containment, while red indicates open fire line. With hot, dry and gusty conditions predicted during the evening hours on Monday, firefighters assigned to the Whittier Fire were focused on dousing hot spots along the rugged southern flank of the blaze. 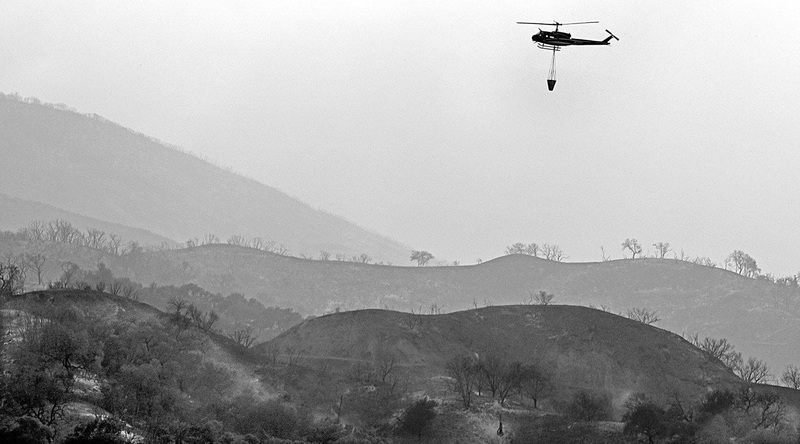 “We’re using the helicopters at our disposal to really hammer that last uncontained piece of line,” said Andrew Madsen, a spokesman for Los Padres National Forest, which is now managing the blaze. The 18,430-acre fire, which has been burning since July 8 in the Santa Ynez Mountains between Lake Cachuma and the coast west of Goleta, has remained at 87-percent contained for about 10 days. The final 13 percent of open line — roughly 5 miles long — is in steep and rugged terrain stretching from the top of Eagle Canyon to the top of Dos Pueblos Canyon on the coastal side of the mountains, Madsen said. Contingency lines remain in place below the fire in case the flames were to be rekindled and blown downslope by the expected sundowner winds Monday night.